Monday August 7, 2017: Paul’s news stuns Sonny, Gabi makes a tough decision, and Joey attempts to save Kayla. Paul visits Sonny at the police station and relays good news – he didn’t kill Deimos. The bad news is that Victor was behind the murder. Sonny is reluctant to believe it. Paul assures him Brady’s trying to get a confession as they speak. Sonny extracts a promise from Paul – if it turns out to be true, he’ll come to him before going to the police. Paul would do anything for him and their future. They express their love and kiss. At the Kiriakis mansion, Brady hollers at Victor for having Deimos killed and letting Sonny take the fall for it. Victor surprises Brady by admitting that’s exactly what he did. Vic confirms he hired Xander to kill Deimos, but says the plan didn’t work out as it was supposed to. He grumbles that the idiot never could take direction, and flashes to Xander showing up at the house looking to renegotiate terms before doing the job. Brady learns Victor told him the deal was off and had his men fly Xander back to Greece. Vic confirms he never would have let Sonny take the fall if Xander had completed his mission, and reveals he suspects Sonny did it. Brady doesn’t believe it. Vic announces he’s going to find someone to pin the murder on, and Brady’s going to help him. At the loft, Joey makes a call to Jade to find out if Tripp thinks his mother killed Ava. Steve busts into the hospital on-call room where Tripp’s holding a scalpel on Kayla. He won’t let Kayla go until she confesses to killing his mother. Steve protests that he did it, but Tripp becomes agitated about his father lying to him. Kayla blurts, “I did it. I killed her.” In Abigail’s room, she awakens to find Chad at her side. He praises her for saving his life – he’s not talking about the car, he’s talking about the picture of him standing over Deimos. Abby confirms that her marriage to Dario wasn’t real, and Chad apologizes for the awful things he said; he was afraid of losing her again. Abigail forgives him. In the waiting area, the doctor joins JJ, Gabi, and Jennifer and relays that Abigail is conscious. Jenn and JJ embrace happily. They enter Abby’s room as Chad’s about to ‘tell her something’. Chad steps out and updates Gabi, who credits him with bringing Abigail back and then asks to speak privately. Meanwhile, Joey enters the on-call room as Kayla’s assuring Tripp she’ll confess to the police. Joey tells Tripp that he knows what Jade let him believe, but it wasn’t Kayla who did it. He states, “It was me. I killed Ava.” As Steve and Kayla protest, Joey comes clean about how he put a pillow over Ava’s face when she threatened his family. Tripp looks uncertain and emotional as Joey cries that he deserves to be punished. Amid shouting and sobbing, Tripp pushes Kayla away and holds the scalpel to Joey’s neck instead. Steve tries to talk Tripp down and convince him they love him – does he want to kill his own brother? Tripp lets Joey go. The kid sags with relief and his parents embrace him. Steve then approaches Tripp, who breaks down in his father’s arms. In Abigail’s room, JJ fills his sister in on the search for Dario, and then Jennifer visits to talk about how Chad brought her back to them. In the park, Chad tells Gabi he will go to the police and confess, as he can’t let Sonny take the fall for something he did. 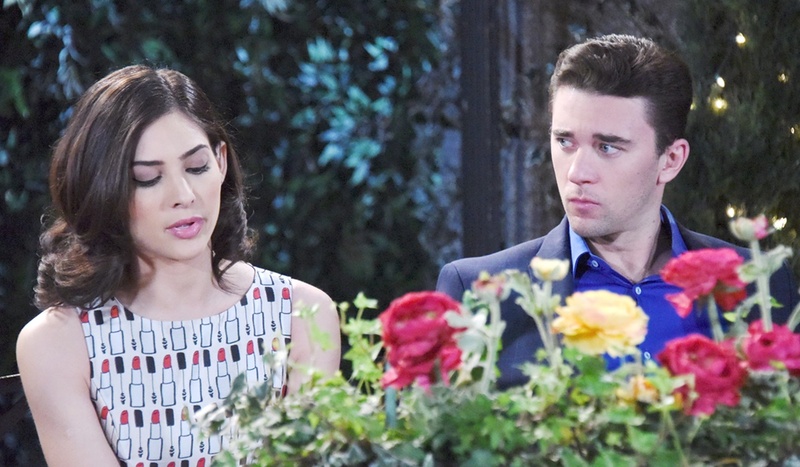 Gabi acknowledges what Abigail did for Chad, and how much she must love him. She adds that Chad has never looked at her as he does at Abigail. She realizes he was never hers to lose. Chad’s sorry. Gabi knows she has to let him go, but assures him she will always love him. Chad confirms that seeing Abigail laying there made him realize how much he loves her. Gabi urges him to go be with her. 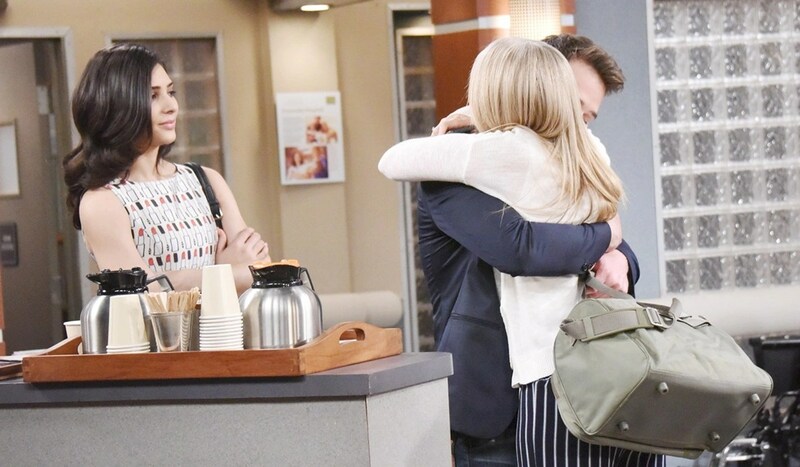 After, JJ happens along and Gabi cries that she had to let Chad go. JJ holds her. Back at the hospital, Jennifer hugs Chad before leaving him with Abigail. Chad thanks Abigail again, for saving him, and she assures him she’d do it all again. Chad sits and declares, “You’re everything to me, Abby.” He apologizes for not fighting for her when she came back and tells her, “I love you. I never stopped loving you.” Abby loves him too. They cry and embrace. Chad kisses her forehead. Hattie, pretending to be Marlena, dumps John.